Just to make sure you are ordering the correct size replacement jumping surface, or if you want to order the high performance weave, please call us at 1-800-667-4991. 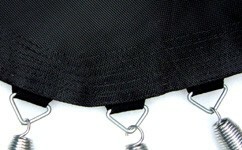 Try our new black mesh "High Performance" weave. This fabric will increase the trampolines performance by 25-30%. (add $100) The jumping surface size for our 11' x 17' trampoline frame will be 7'4"x 14'4" with a 9" spring and 7'x14' with our 10" spring.